The Order Ticket window is used to quickly define and submit custom orders. 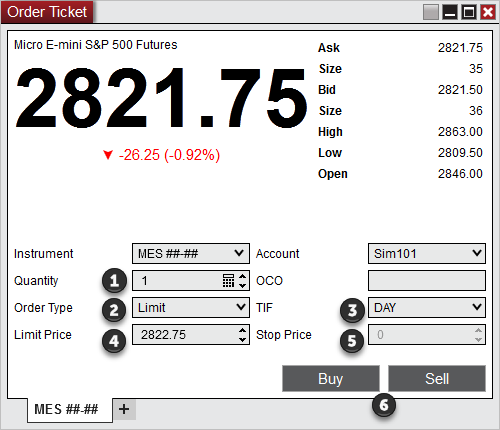 This interface does not display any type of position or trade management features. For those purposes, you would want to consider one of the other order management features: Basic Entry, Chart Trader, FX Pro, FX Board, or SuperDOM. There are multiple ways to select an Instrument in the Order Ticket window. •With the Order Ticket window selected begin typing the instrument symbol directly on the keyboard. Typing will trigger the Overlay Instrument Selector. A list of all connected accounts will be listed in the Account Selector. To change the account select the account you wish to trade through via this drop down list. 2. Hold down the CTRL key when increasing/decreasing limit/stop prices to change the price in steps of 10 tick increments. The Order Ticket window can optionally be configured to automatically close the current tab or window after the order has been submitted. This was designed to help discard unwanted Order Ticket displays when trading multiple instruments. After the order has been submitted, it can be referenced from the Orders Tab of the Account Data or Control Center window. The Order Ticket window allows you to specify a custom user defined OCO ID using any combination of numbers and letters in the OCO field. 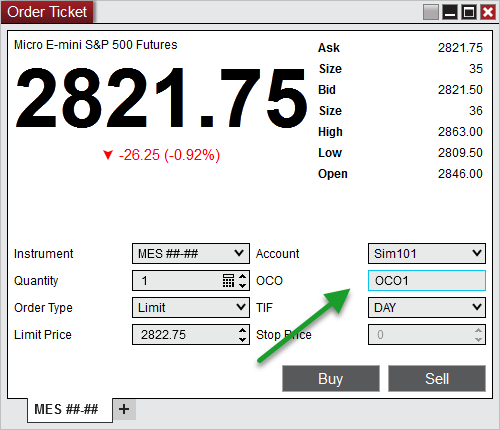 The image below shows the Order Ticket window configured a pending order in which we've input an OCO ID of "OCO1". In the example above, any additional orders placed with the OCO ID set to "OCO1" will be tied together in an order group as long as these orders are active. If one order in the group is either filled, cancelled or rejected, all orders in the group with the same OCO id will be cancelled. Warning: If an order which was part of an OCO group has already been filled or cancelled, you will need to submit the pending order with a new OCO ID otherwise the pending order will be rejected.